Hi! This took longer than expected, but… Dianara 1.0 is out! The main highlight in this version is probably the possibility of editing your posts. 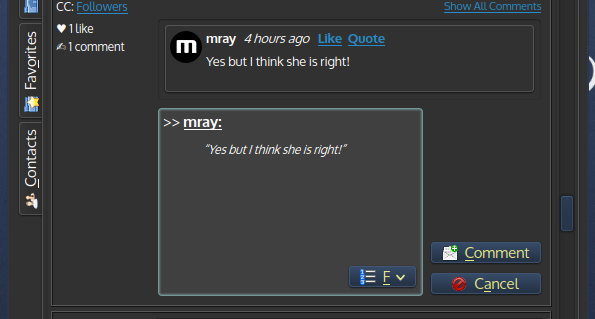 Also, being able to send posts to ‘person lists’, and quote parts of a post or comments. The manual resizing of posts is no longer available, but now they should auto-resize much more nicely, and the contents inside, specially images, should scale correctly. Regular notes can have titles now, just like image-type posts. This is very useful, because when notes have titles, the “Meanwhile” column becomes a lot more intuitive! Oh, and last but not least, Dianara is now available in Italian, thanks to a great job by Metal Biker. Ability to create person lists, delete them, and post to specific lists. Better posts resizing (no more splitters). Optimize image sizes inside posts and comments. Avatar upload in profile editor. Author’s avatar in posts is a button with several options. Show if a post has been updated, and when. Show “To” and “CC” recipients in posts as links. Option to paste without formatting (as plain text). Make proper links automatically when pasting a link-like text. Option to quote comments. Selecting text in a post before clicking “Comment” also quotes it. Regular notes can have titles. Some more text formatting options. Selecting “Normal” now clears colors, too. Partially fixed the ever-increasing memory usage issue. Dianara 1.0 is available in English, Catalan, Spanish and Italian languages. A Polish translation is in the works. Dianara is available in the repositories of several GNU/linux distributions. At this time, at least Debian Testing/Sid, Mageia Cauldron, Chakra and Ubuntu 13.10. I’ve been told that it will also be coming to Fedora‘s repositories. For now, you can get it from Moggers’ repo, where you can also find Pumpa, another Pump.io client. There are Dianara packages for openSUSE available. You can also find it in Archlinux’s AUR, and there is a Gentoo ebuild. Check the INSTALL file for details on how to build it. This entry was posted on Tuesday, October 29th, 2013 at 1:54 AM and is filed under Dianara, GNU/Linux, Projects, Pump.io, Qt. You can follow any responses to this entry through the RSS 2.0 feed. You can leave a response, or trackback from your own site. 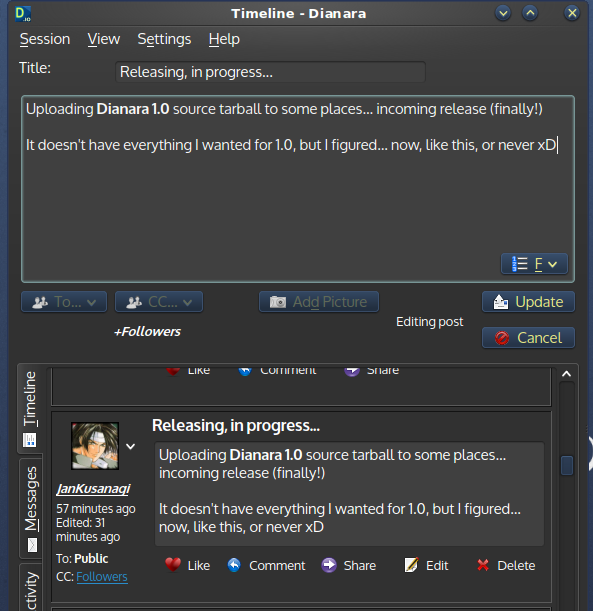 One Response to Dianara v1.0 is out!